The Acer Predator Helios 500 is big, bold and powerful. It packs a lot of punch under the hood and you certainly get plenty of bang for your buck, but is it just a bit too ugly on the outside? Stunning visuals and excellent gaming performance are highlights, shocking battery life is almost certainly a low point. 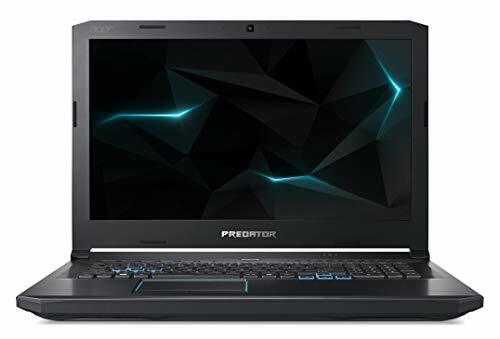 Acer has a range of gaming laptops under the Predator banner that offer high-end gaming specs with blistering performance possibilities and a reasonably subtle design that's almost suitable for daily use. The current top-end of that line-up is the Acer Predator Helios 500. This is a big, bold and brazen laptop with specs that gamers will love. But are high-end specifications alone enough to please? We've been testing one of find out. The Acer Predator Helios 500 is available in three main specs, each of which offers pretty incredible specifications housed within a chunky frame. We tested an AMD powered version with a CPU that's overclockable up to 4.1GHz and a Radeon RX Vega56 GPU to power the big and beautiful 17.3-inch, 144Hz Full HD display. To give you an idea of just how serious this machine is, the other versions available include Intel's Core i9-8950HK processor. These machines are designed to be real powerhouses for avid games who don't want a fully-fledged desktop format. There's 16GB of DDR4 RAM and an NVMe SSD to round-off the package, creating an ultra-fast gaming laptop that's built to please. The model we tested came with a 256GB drive as the main boot drive and an extra 1TB HDD for storage purposes. This is a great combination as Windows boots up quickly and anything you install on the main drive benefits for the extra speed too. We managed a couple of games and software installs, but it quickly filled up as you can imagine. Having the extra storage is a must for a decent Steam library. All that power has to go somewhere though and the resulting frame that houses it is fairly gargantuan. We'd go as far as saying that this laptop is heavy and somewhat unwieldy. It's not one you'd want to sling in a bag and lug with you to the office. If you're looking for something portable then the Razer Blade 15 or Asus ROG Zephyrus S GX531 might be more suitable (and more stylish too). However, if you're after something that offers power and punch to deliver a superb gaming experience, excellent multi-tasking and stunning visuals too, then this might be it. Sure, the Predator Helios 500 has large bezels and a larger frame than we might like. Its power supply might weigh a tonne and it might sit a little too high off the desk but it's not to be sniffed at. But despite not being a looker, this machine is capable of beautiful things. During testing, we found this laptop was more than capable of handling gaming and multi-tasking with ease. We're also happy to report that on default settings the Predator Helios 500 is quiet - even during intense gaming sessions. This is thanks to the bulky frame and large cooling vents at the rear of the machine. That quiet functioning is a highlight to the design as it keeps things nice and peaceful for distraction-free gaming. It also means if you're planning on recording or streaming your games, you don't need to worry about fan noise ruining things. If you feel like you're not getting the performance you deserve then you can always crank the fan speed up. Max fan settings put the fans at over 4000rpm each, which makes quite a racket and blows a bluster too - but does a brilliant job of cooling. The design also features some fairly capable stereo speakers and an impressive microphone that's able to pick up multiple people speaking in the same room - ideal for conference calls, if you're into that sort of thing. Any gamer worth their salt will want an additional gaming headset, but it's not essential here, which is great news. This laptop boasts a large 17.3-inch display, which offers a brilliant gaming experience and is great to use on a day-to-day basis for work, surfing and video streaming too. It's a capable screen, built with the ability to handle 144Hz refresh for fantastic gaming visuals. The device also boasts AMD FreeSync capabilities - allowing it to support a dynamic refresh rate that reduces screen tearing and other visual issues that might hinder your gaming experience. Despite the size of the bezels, the screen is actually very impressive. Vivid colours, excellent brightness and good viewing angles make it a pleasure to use whatever you're doing. There are display customisation options in AMD Radeon Settings software too. These allow the option to switch between default, cinema classic, enhanced, home video, outdoor, sports, vivid and custom settings. This software also has options for brightness settings - between maximising screen brightness or focusing on battery performance. Another highlight to the Helios 500 is the ability to easily output to multiple external monitors. There are both HDMI 2.0 port and DisplayPort 1.3 outputs on the rear of the machine that work wonders for sharing the power across other monitors. Of course, doing so reduces some of the gaming performance and may impact visuals. As an example, we found this laptop was capable of running Battlefield V on max settings in the high 90s in terms of frames per second. But when paired with another screen (an ultra-wide monitor running 3440 x 1440 resolution) we only managed around 50-60fps (we say 'only', but that's pretty good going!). Other testing with 3DMark and benchmarking with Shadow of the Tomb Raider return decent results - on the highest settings, a benchmark got between 40fps and 70fps depending on how high anti-aliasing was set. An impressive score indeed. Of course, the Helios 500 is capable of running powerful VR headsets, though the company would probably prefer you paired it with the Acer Windows Mixed Reality headset. We tested it with the Oculus Rift with no problem at all and enjoyed a smooth and comfortable VR experience without issue. The Predator Helios 500 is compatible with various programs that allow you to customise the device, including the Predator Sense software which allows you to adjust keyboard lighting, tweak fan speed (as we've mentioned), and more. You can setup profiles for keyboard lighting, macros and fan settings within the software which can be switched on the fly with the buttons at the top of the keyboard. You can also sync these to launch your favourite settings with each specific game allowing for a custom setup for every game you play. The Ryzen Master software, meanwhile, allows for tweaking and overclocking of the device to eke even more performance out of it. Should you need it. There are plenty of connection and output options with this gaming laptop. Our favourite is obviously having both DisplayPort and HDMI outputs for other monitors or VR headsets, but a wealth of USB connections also makes life easier. Other highlights to the design, in our mind, include simple things like the addition of an Ethernet port - which allows you to plug right into your router for the best online gaming performance. There's also Killer DoubleShot Pro wireless support, which is more than capable of delivering fast wireless speeds and problem-free gaming - but we do like having the ability to plug in without using any additional adapters. The Acer Predator Helios 500 boasts enough room for a full-sized keyboard, including numpad, a mass of functional keys and media buttons. These keys are backlit, as is the trackpad, which is pretty funky. You can press the lighting key to switch on or off here too: lighting for the keys and trackpad, just the trackpad, just the keys or no lighting at all - the choice is yours. Keyboard lighting is split into zones, which allows you to change the colour of the lighting across four separate zones of the board with ease. It's fairly understated and not too in-your-face. There's a nice highlighting to the WASD and arrow keys, but with the lighting turned off it wouldn't otherwise stand out as a gaming laptop - if you wanted to use it in a more 'serious' setting. The main problem we had with this device is its sheer size. The large frame that's necessary to house the powerful internals results in a design that sits tall on the desk. This can lead to some wrist discomfort if you're using it throughout the day, unless you like to sit nice and high at your desk (we're a bit slouchy, but isn't everyone). On your lap it's not an issue, but if you're planning on playing on a desk it's worth bearing in mind. One place where the Acer Predator Helios 500 falls down is battery life. The AMD powered version is especially problematic. The official specs say that it should last around one and a half hours. That was accurate in our experience. But you can read that again: a mere one-and-a-half hours per charge. We tested in a variety of situations. When using the laptop to surf the web, write some content and send emails, we soon found the battery running low on juice - within just an hour. That was with keyboard lighting on, screen brightness at max and occasional audio use on Skype too. More sensible use with brightness down, battery optimisation on and more gets extra time out of the machine before it needs plugging in - but not beyond the 90 minute mark. Interestingly, the Intel/Nvidia powered versions can apparently muster three-and-a-half hours according to the specs, though that's not something we were able to test. We did request a second sample of the AMD model, however, just to verify that it wasn't an anomaly. For gaming, we found we couldn't get the Helios 500 to run efficiently or with a decent frame rate without the power connection. Tweaks in the AMD software made little difference. The result is a gaming laptop that always needs a power connection if you want to game and will barely allow you to finish streaming a film on battery juice alone. Overall that's disappointing when you consider the weight and size of this thing. You'll probably not think about taking it out of the house too often anyway. If you're all about power and performance over looks, then this is the laptop for you. However, if you want something light and nimble that can last for hours without being plugged in, this is not it. We were impressed with the power of the Helios 500, its multitasking capabilities and all its bells and whistles. However, we were equally unimpressed by the cheap feeling design, large bezels and fairly shocking battery life. The end result is a gaming laptop that leaves us with mixed feelings. Whether it's right for you will depend highly on what you're hoping to get out of it. If you want something that stays at home, plugged in, ready for action, then the Helios 500 might be a good choice. But then why not just buy a desktop machine? Especially for this amount of money. The Razer Blade 15 is a fully capable laptop that also boasts a fairly high-end spec. It has a smaller screen, but that display is also 144Hz capable at 1080p. There's a 4K 60Hz version available too. It's compact, lightweight and understated and wouldn't look out of place in the office, but still delivers gaming performance when you need it. This Razer laptop also has enough juice to keep going and going - for up to six hours - and so is much more portable and useful. With the GX531, Asus claims to have made the world's thinnest gaming laptop. At least at the time of release. It's also a powerful Ultrabook-style design with ultra-thin bezels, a 144Hz refresh rate and 3ms response time. We found the battery performance to be on the poor side, but otherwise found this to be a real corker of a laptop with plenty of excellent features.